Our hot yoga teacher training courses are certified by the Yoga Alliance. When the course is completed you will hold a 200h certified yoga instructor license and be able to teach Hot Vinyasa, Hot Hatha and regular temperature yoga in studios anywhere in the world. The classes will be given in SPANISH, but you can ask for the manual, ask questions and do the exams in English. Our teachers are bilingual and can solve all your concerns in your own language. Different styles of yoga including Yin, Restorative, Prenatal, Acro, etc. The courses are held at the Yogalinda studio in Vila Olímpica del Poblenou, Barcelona. 14:00-17:00 – Theory, Practise teaching etc. Cordelia is a yoga teacher, artist and translator. She took her first yoga class in 2001, and has kept practicing ever since. She sees yoga as a powerful tool for emotional, physical and spiritual healing. Her classes incorporate elements of various styles, especially Hatha Vinyasa and Ashtanga, and increasingly enter into dialogue with other disciplines that work with somatic awareness, breathing and movement. For her, the yoga class is a laboratory where students can ground, flow, strengthen, connect, express and deepen their self-awareness and connection to the wisdom of the spirit within. 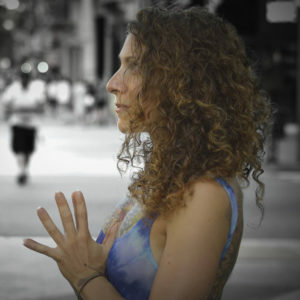 She took her first ashtanga intensive with Jennifer Elliot in Charlottesville in the summer of 2002, and deepened her studies in Mysore and Kovalam, India in 2006 studying with Sri. Sheshadri and Lino Miele. In Barcelona he trained with Rocio Ramos and Amelie Strecker in 2012-2013 (Yoga Alliance 200h), participated in a training with Patricio Morales in Ashtanga (Summer 2014) and also has studies of Thai massage (150-hour certificate, 2016) with Oscar Prema. She considers Dharma Mittra, Hojung Auderade, Aleix G. Rios, Kathy Paez, Claudio San Martin and Tiago Rocha, among other professors, as big influences. She did a Vipassana sit in in 2012, and maintains a regular meditation practice. For years he has practiced different kind of sports such as swimming and capoeira. One day he decided to take a step beyond the simple physical activity and also quit his job as a computer technician to devote to learning and teaching yoga. After years of practicing different styles, he made his first training as a teacher in a course recognized by Yoga Alliance 500h. He continues his training by attending retreats and intensive courses with great masters of Dharma Yoga, Ashtanga, Vinyasa, Vinyasa Flow, Jivamukti, and Sattva Yoga Iyengar as Andrei Ram, Dov Vargas (Dharma Mittra´s son), Jai Sugrim, Manju Jois (Pattahbi Jois´s son), Gustavo Ponce, Cristina Newton and more. As an instructor, he attempts to bring together the best that forwarded their teachers without forgetting that in yoga, we are ourselves students. He emphasizes on concentration and breathing, basically to allow each practitioner to find his own way. Heather began practicing Hot Yoga in Toronto, Canada 20 years ago. After going to her first class she was hooked on the way her body and mind felt. Over the years she became involved with a yoga clothing line called yogagurl and started helping the founder promote, sell and market the products. The love of the Spanish language brought Heather to Spain in 2006. After several stressful years in sales in a crisis market, Heather decided to follow one of her life long dreams to become a certified yoga instructor. Heather has been lucky to have been trained under Baron Baptiste (Baptiste Power Hot Yoga), Ted Grand (Moksha Hot Yoga), Bikram Yoga, Rodney Yee, Alex Leikermoser a.k.a. yogagurl and the Tribe yoga instructors, Scarlett and Raquel. Heather is certified in teaching hatha vinyasa. Heather feels such joy in helping others make their dreams come true and is always open and honest about how she opened her yoga studio. Inf you are interested, please read: Yoga Coach & Yoga Business Consulting. 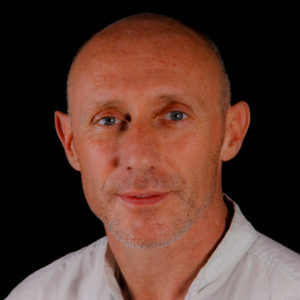 Mike Brassey has been practicing and teaching meditation in Spain, Portugal and England for the last 20 years. He has studied for over 10 years with the Tibetan Lama Geshe Kelsang as a Buddhist monk and is currently a student of Eckhart Tolle – author of the bestseller “The Power of Now”. Michael is known for his ability to convey the teachings in a clear and practical way. His presence is an inspiration to those who want to begin or deepen their experience of meditation and inner peace.